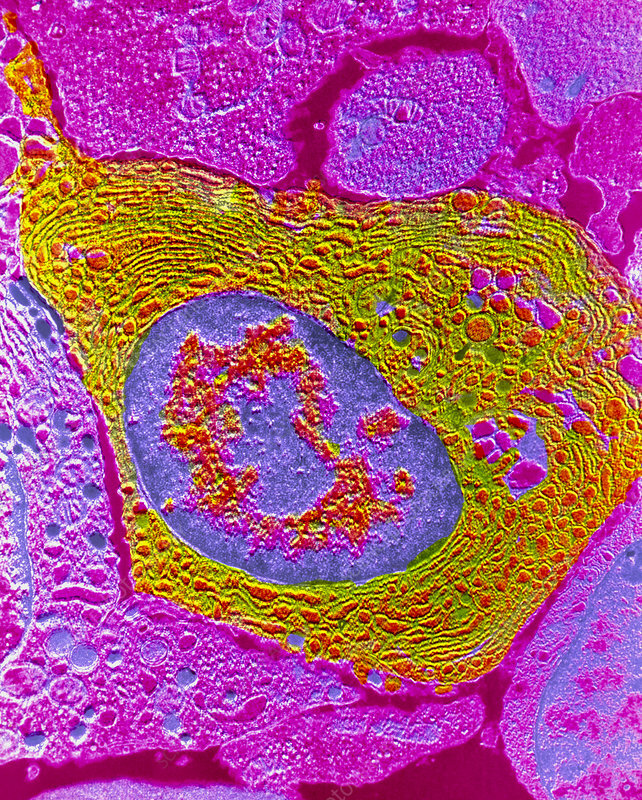 False-colour transmission electron micrograph of a human plasmocyte, a mature B-lymphocyte (white blood cell) that synthesizes and secretes antibodies for the immune system. Characteristic of a plasma cell is the parallel array of the rough endoplasmic reticulum, (yellow/green), the cisternae (elements) of which become dilated with antibodies (immunoglobulins). Antibodies produced by a single plasma cell are of one specificity and immunoglobulin class. The blue oval at centre is the nucleus which includes dark-staining chromatin (orange). Magnification: x4200 at 6x7cm size.